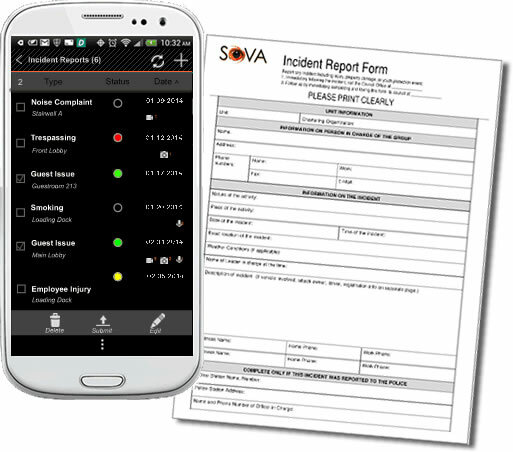 Write incident reports on the fly with a full compliment of tools at your disposal. Easily add audio, video, images and witness statements with signatures. Transcribe voice into text if you don't like typing on a tiny mobile keyboard. You can even start the IR writing process on your mobile device then send it to the web for later processing on your PC from the comfort of your office. Improve your compliance by storing incident reports electronically on our secure server with 24 hour monitoring. Learn about our "IR Lifecycle" below. Our exclusive IR lifecycle maintains tighter controls over your incident reporting by limiting access at different times during the submission and approval process while keeping track of versioning so you can always see who changed what, and when. The person who creates the IR in SOVA becomes the owner, and from that point forward they are the only person allowed to edit the IR. An admin has the ability to review a submitted IR and can choose to accept or return it for further editing. A security officer can choose to add a map to their incident report to show the exact location where the incident occurred by placing a pin on a map. Data is compiled on the web dashboard to see what types of incidents occur most frequently at your location so you can more effectively manage risk. Tasks can be assigned to tour checkpoints on the fly directly via the web or mobile device. Let's say you have a event scheduled that carries some unique risks that you want covered. Simply add tasks to the tour buttons in this area prior to the function, sync your changes, and automatically all staff working the event are reminded of critical operational items that you need done. After the event, simply remove these tasks and it's back to business as usual.